Welcome back indeed, and a warm welcome from me to our new correspondent, minimus, a sort of Mini-Me to my Doctor Evil, but without the sadly dated puns. Always happy for other writers to surface as well – drop us a line if you want to. Hope you had a good time over your holiday – I did. Couldn’t keep me out of the water. I wanted to start off with a post about what is coming up in the New Year, but there’s a subject that we really can’t ignore. Natural disasters. 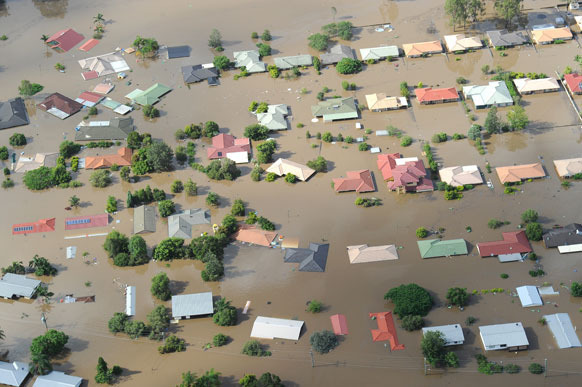 No, not my hairstyle, my dress sense, or even my attempts to diet over Christmas – we’re talking real disasters: raging torrents, muddy waters, and big dollops of thick brown mud, all over Australia. Well, Brisbane to start with, but it is moving on to Victoria as well as we speak. There are some pretty savage waters raging there at present – although, if you cast your mind back to just a couple of weeks ago, we had some really severe weather in NZ as well. Here’s the Aorere valley near Nelson – it may have escaped your notice, as no one was staying indoors to watch TV – let’s face it, you were probably at the beach. Cue disgruntled campers who got washed out – but luckily not washed away. Nothing quite like Oz though. Everything there is bigger, even their floods. 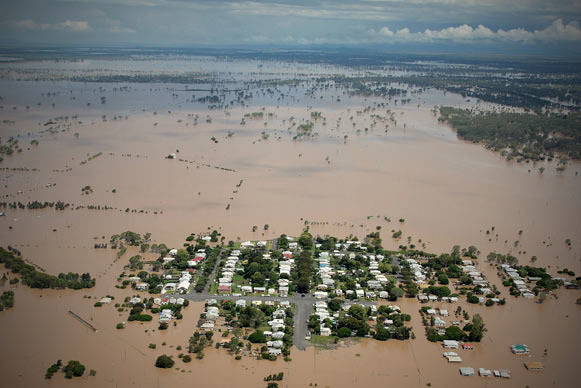 Rockhampton, and Toowomba in particular, have seen some savage conditions. You could take the laconic, pragmatic, phlegmatic viewpoint that we’ve normally come to expect from our poor cousins on the West Island, that it is about time the bloody drought was broken, and that a new coating of rich organic silt will do wonders for the garden, but I suspect that they’re not being quite that chipper about this mess. Particularly in Ipswich, which shows that Councils need to adjust their attitude to flood plains drastically. Most importantly, cities need to look at their provisions of ground floor infrastructure. 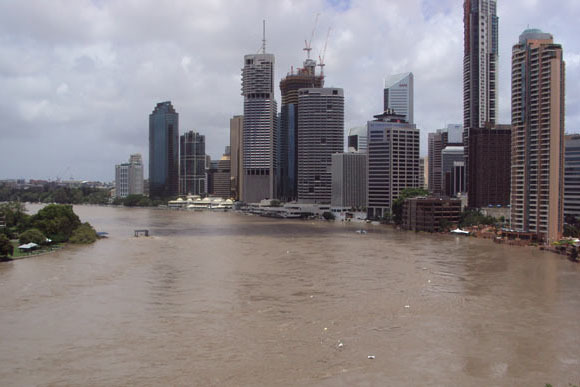 Brisbane in particular is feeling that right now – having lost not just their basement but their ground floor to the water still flowing through the city. 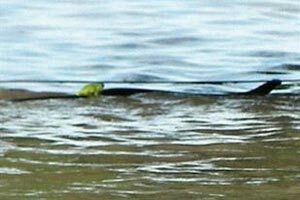 In a rare moment of good news, one image from the flooding has really gone viral, with a snap of a frog hitching a ride on a snake. Despite mutterings of packed lunch, that’s got to be the real disaster point of this flood – only 10-20 people dead, but probably hundreds and thousands of dead stock, not to mention all the other critters. I’m not especially sure that Wellington is not just as vulnerable. 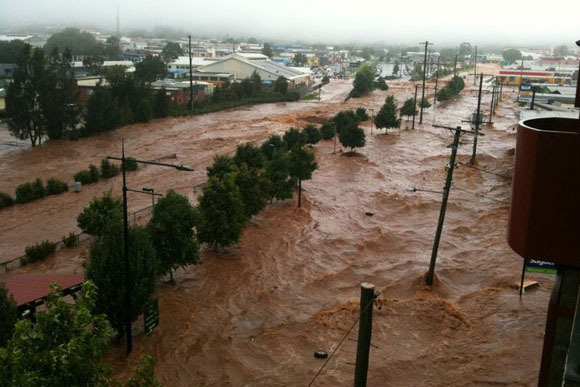 Certainly the Wellington region is highly vulnerable to flooding – the Hutt valley of course is nothing but a massive flood plain (flood plane?) as well as being vulnerable to earthquakes and tsunami to boot. Still: how would we cope? 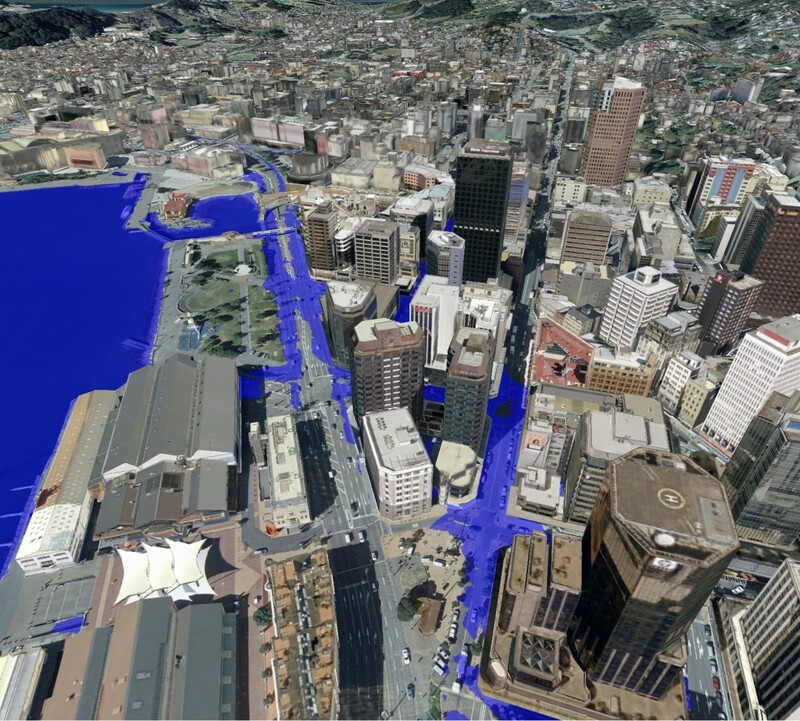 In 2009 the following image was released, showing what may happen to Wellington CBD with a 1m sea level rise. The headline at the time was: Doing Nothing is Not an Option. So, what exactly has happened since then? Nothing. Which proves that ‘doing nothing’ *is* an option. Higher ocean levels force Ventura officials to move facilities inland, an action that is expected to recur along the coast as the ocean rises over the next century. Much easier to do with a road and a bike lane, than our waterfront I would imagine…. I’m more worried about an earthquake, considering our two major motorways and main water supply line run right along the Wellington Fault… Aslong as it doesn’t happen in the next 100 years I guess. Easy – whack a dike around the perimeter and make it a cycle lane/promenade on top. 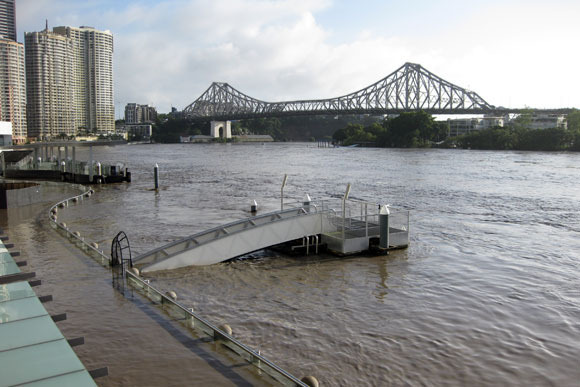 actually, I imagine that’s what Brisbane thought when they whacked their dike around the side of the river. Trouble is of course, as N’Awlins found out during Katrina, that once the water gets in behind the dike, its just as hard to get it out again. New York has a similar abatement plan that would require the installation of at least 3 such devices to protect the city. Similar devices are in the works for london, st,. Petersburg, of course Venice. Now personally, I like the the idea of the high sea wall. In seattle there is a tour you can go on, of all of the abandoned streets and walkways after the elevated the level of the city. In the 19th century, because of various reasons they decided that they needed to raise the level any where from one story to 3 stories, so they filled in the streets. At one point apparently, the sidewalk was still down low, and you had to climb a ladder to cross the street. With a high seawall, we could raise the effective ground plane of our streets by one level, but keep the existing streets as an underground transport system. Lambton quay would become a transit tunnel for bus routes, or hopefully light rail. Jervois quay would become a buried quasi motorway, and on top we could have narrow streets and roads with more pedestrian/park space, a stronger connection to the waterfront, etc. Unfortunately the sea gates at the harbour entry is probably more feasible. I forgot the news article that was intended to go along with my post. With sea levels rising, once-a-century floods may become once-in-20-years events. One solution: huge storm-surge barriers. dammit! and I also forgot to include this wiki link about seattle. I was thinking of writing an entry about Seattle. Quite interesting as it’s landscape is entirely man-made. Entire hillsides removed for ease of construction. Lakes linked, downtown areas raised. They moved a lot of soil in the late 19th century/early 20th. Less of the little, buddy. Sea rise can be fought by a seawall around the harbour – out by the motorway it needn’t be anything flasher than an earth embankment with some hardfacing. Petone Beach and Oriental Parade already have some sort of seawalls and as for pipe outflows, they can be gradually raised over time and/or fitted with return valves. Hinge a flap over the outlet and hydrostatic pressure stops backwash but feck I’m only an engineer. The road to Eastbourne will get a bit dicey though. Vaulted streets would be great – all those service vehicles banished underground.The only problem I can see with that plan is the cost. How about a compromise? A cheap-ish seawall around the whole harbour with a raised area starting at the Railway Station crescenting around to Oriental with it’s fattest portion towards courtenay Place. No Nike swoosh jokes please but it would suit to stuff all those bottlenecked bus and car lanes underneath whilst preserving a world-class promenade for fine fish to fin about on top of which is, after all, where fish belong. 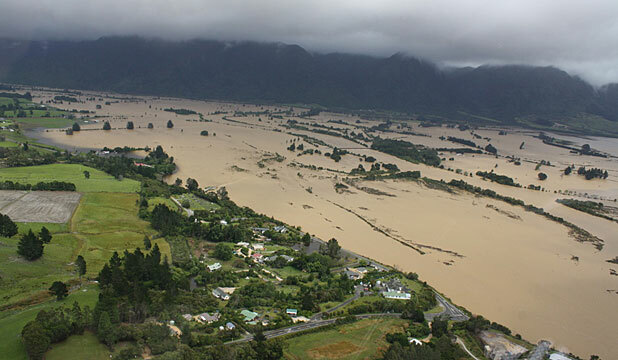 >Here’s the Aorere valley near Nelson – it may have escaped your notice, as no one was staying indoors to watch TV – let’s face it, you were probably at the beach. I was at the beach. Unfortunately the beach I was at was about 500m to the right of the near shore in your aerial photograph. I was camping with some friends in Collingwood. It was a fairly rough night in a tent with 100+km/hr winds and rain, then waking up to find that the estuary was within about 20cm of overflowing its banks and running through the campsite. Oh, and it had taken most of the nearby jetty with it, was a scary brown colour, and the water was moving real fast. Still, a day spent driving around axle deep flood waters photographing the water overflowing the roads was more fun than another day in the sun.